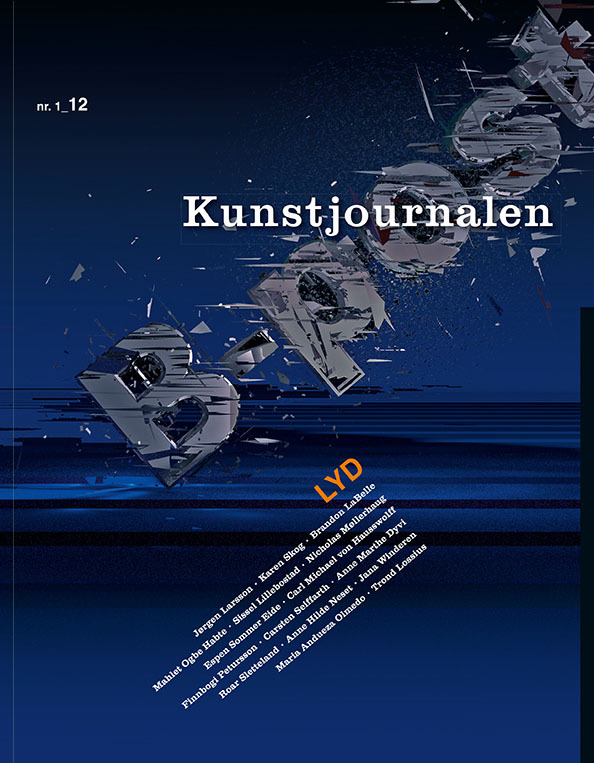 The first issue presents texts and art projects by Marianne Heier, Rakett, Tore Vagn Lid, Terje Nicolaisen and more. A contribution toward stimulating an increased dialogue around some of the phenomena which for us represent the 00's. Art as Notions of the Impossible Made Possible? 17 texts and art projects that research how artworks articulate themselves in the tensions between the visionary as utopia and the visionary as dystopia. How does reflection and immediate encounters with art relate? 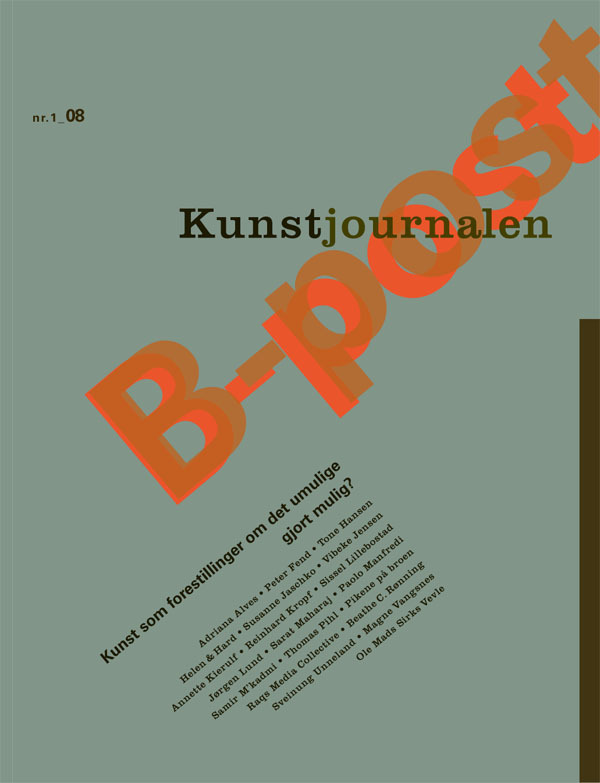 This edition presents artists and themes that the editors for more or less clear reasons are engaged in. How can art based on research into archives and history, illuminate present social and political challenges? The 2012-issue discuss audio art, sonic art, sound art – art that makes use of sound in one form or another. 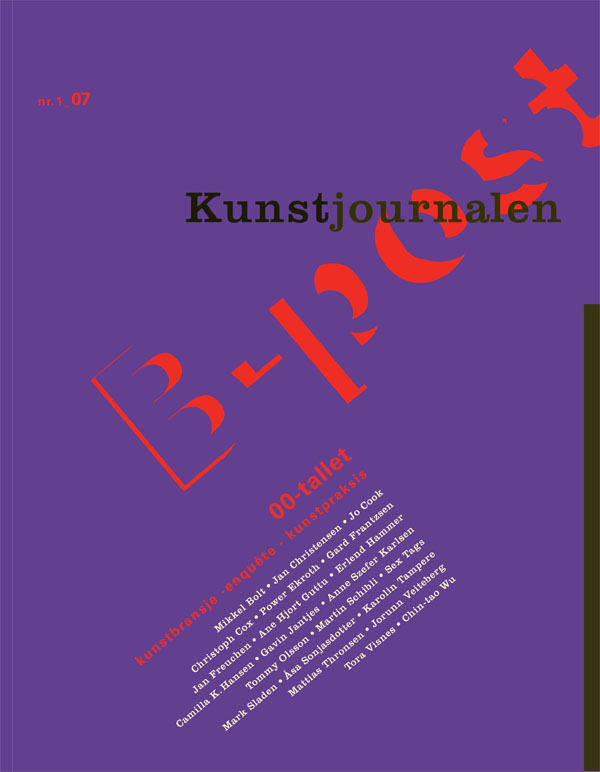 The issue includes visual and sound art projects. 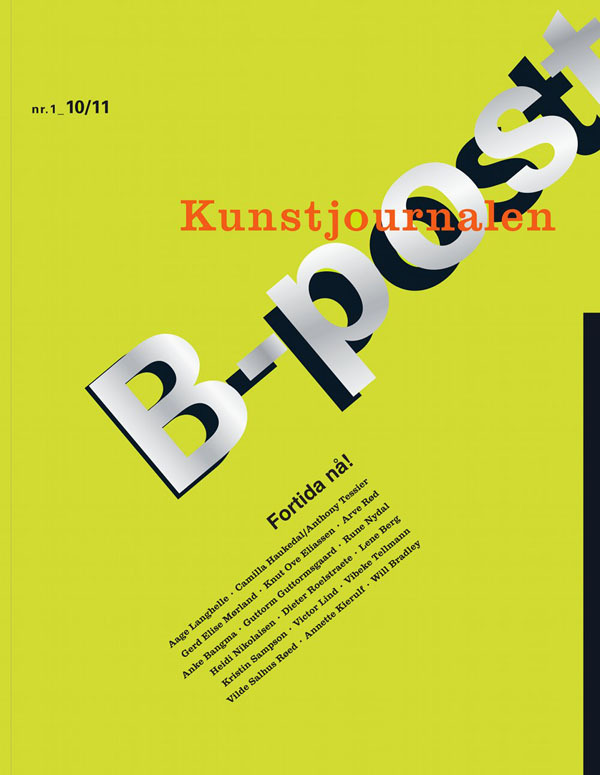 A critical examination of the three biennials realized in Norway in 2013, including art projects by artist shown at the biennials. Texts and art projects by Anne Szefer Karlsen, OPPSAATO, Ridder, Hilde Skjeggestad, Dag Wiersholm and more. 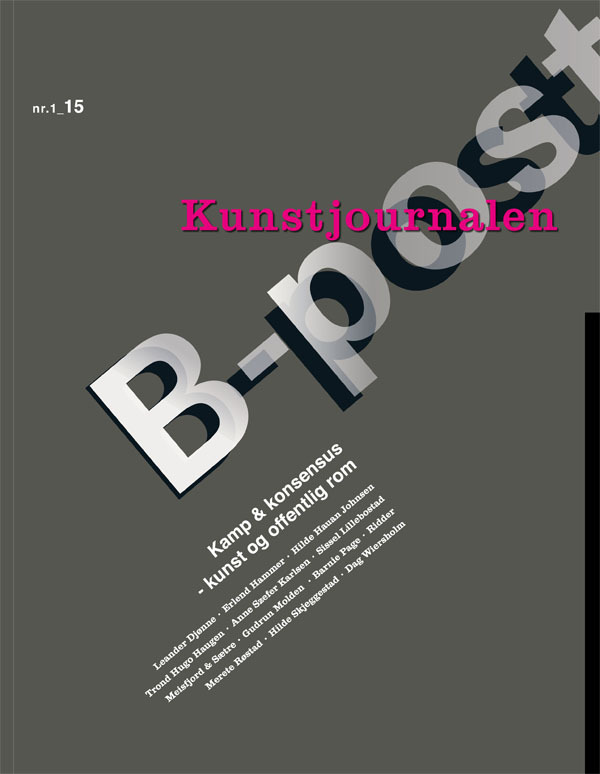 Kunstjournalen B-post is a Norwegian journal on contemporary art that was published annually 2006 - 2015. Each issue discusses current themes through commissioned texts and art projects. This English edition consists of selected translated texts. 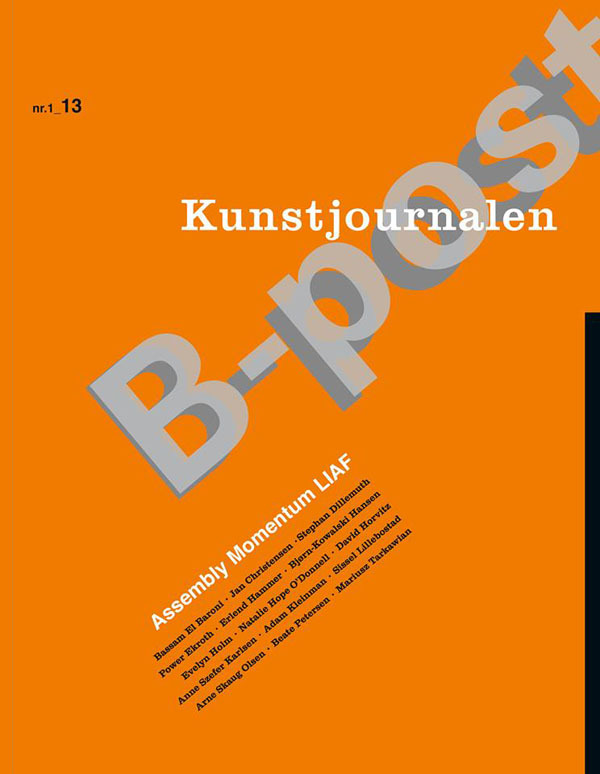 The memberes of the editorial board, based in Bergen, Norway, were Jannecke Heien, Annette Kierulf, Sissel Lillebostad, Arne Rygg, Bjørg Taranger, Maia Urstad, Mari Aarre, Steinar Sekkingstad, Arne Skaug Olsen, and Trond Hugo Haugen. 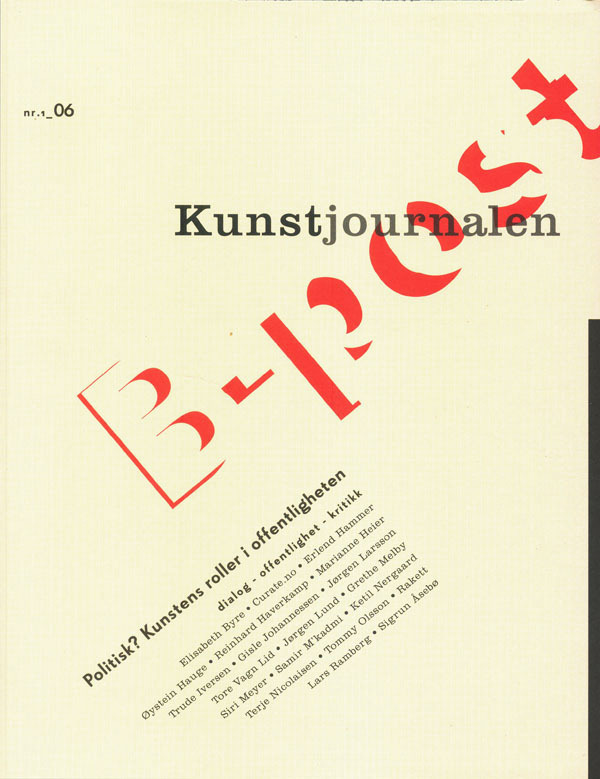 Design of the printed edition: Jannecke Heien and John Ringstad. ISSN: 1890-2111. 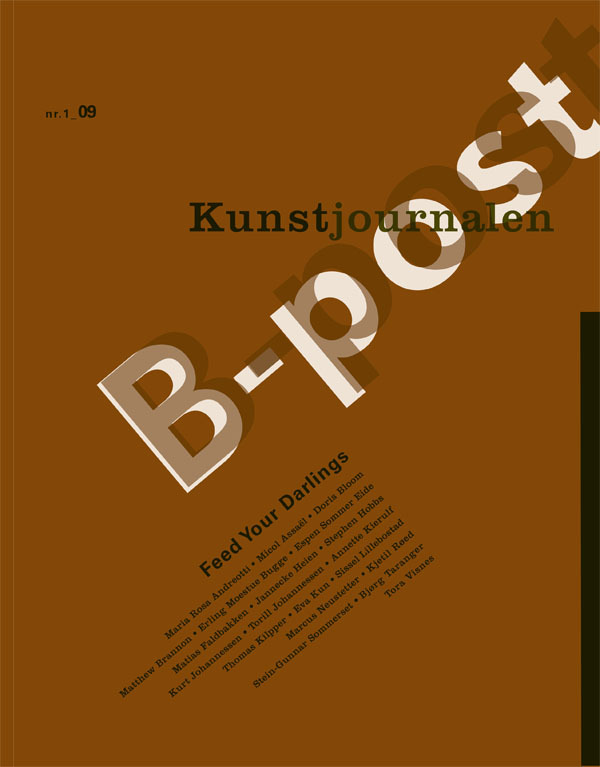 Kunstjournalen B-post was published by Foreningen av 2007 til fremme for kunstfaglig refleksjon og debatt with support from Norsk Kulturfond, Bergen kommune, Institusjonen Fritt Ord, Bildende kunstneres hjelpefond, Hordaland fylkeskommune and Norske Billedkunstnere.